YouTube is possibly the biggest haven for video content and if you’re a heavy user like me, then there’s a possibility that the need to access your history might arise at some point in time. Be it to revisit a music video or share an informative video with your friends. Hence, YouTube for Android has been updated to let you access your watch history without much hassle. 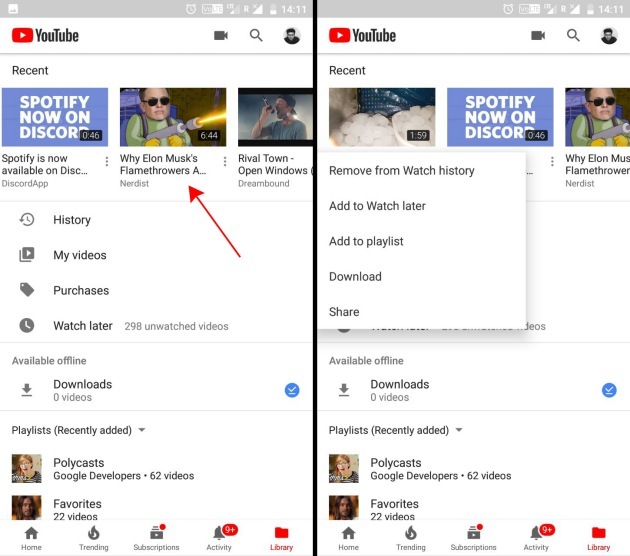 With the newest update (version 13.03.58) for YouTube’s Android app, which is rolling out to all users, the company has debuted a nifty little change in the left-most ‘Library’ tab in the app. You’ll now see a scrollable carousel of the videos you’ve recently watched at the top, making it quite easy to check out your history. As you can see in the screenshot attached below, the carousel would now complement the “History” section already available in the app. The former is for access to content you’ve seen a few hours ago, but the latter is to check out the complete list of videos that you’ve seen to date. The overflow menu for the videos in the carousel allows you to remove the same from the watch history. You can also save them for watching at a later time, add to playlist, as well as download or share it with your friends. In addition, we already know that the video streaming giant is planning to introduce a ton of new features to the app. YouTube is currently in the middle of developing a dark theme, incognito mode for private video viewing and an improved ad-skipping experience. And ever since the adpocalypse and the Logan Paul controversy, YouTube has also decided to tighten the rules around monetization and promotion of positive content on the platform. These steps will allow the company to show better video content and recommendations to its massive user base. So, making its app more intuitive for them also plays a minimal role amidst all this chaos.